A Meychain (mee-cheyn) is a personalized name keychain made just for you (Me). To place an order, find and click the name you're looking for on the "Meychains" page, then enter a quantity and click "Add to My Cart." You can similarly add several Meychains. When you are ready to pay, you can go to "My Cart", submit the requested details and complete your payment with Paypal. Don't worry, we're on it! Please visit our "Other" page or click here. What is that cool rotating thingy? No more camping out by the door and dreaming of the mailman! We've created 3D models similar to what you will be receiving in the mail so that you don't have to wait to see your Meychain. You can use your mouse to rotate (left click), move (right click) and zoom (wheel) into your Meychain. The actual Meychain you receive may be slightly different, but it will be a high quality metal keychain. When will I receive my Meychain? 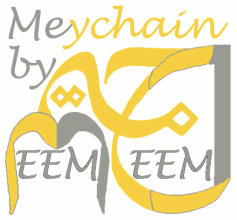 Meem Jeem is working diligently to get you a high quality Meychain as soon as possible. We will notify you of shipping information as soon as it is available. Not at the moment, but if you engage us via social media- like, comment, tweet, etc- you may just receive one FREE in the mail!